Dr. Michael Quinn is one of the foremost experts on the LDS Succession Crisis. He says there were seven legitimate succession claims following the death of Joseph Smith. In a previous interview, John Hamer said Sidney Rigdon was the best option according to canon law. I’ll ask Quinn that question, and we’ll talk about some of the other candidates. Michael: I would disagree with John Hamer that Sidney Rigdon was the most likely. He was the first publicly proposed alternative to the Quorum of the Twelve and he was voted down by the congregation that met in August of 1844. When their choice was only Sidney Rigdon or the Quorum of the Twelve, they chose the Quorum of the Twelve to continue in the Twelve’s position in its place of having all this prior role administratively within Nauvoo, the headquarters of the church. And they rejected Sidney Rigdon. But the fact that he was the first publicly proposed doesn’t mean that either one of them was the most likely. That was the choice that the Quorum of the Twelve and Sidney Rigdon had advertised. And this had been advertised before the Twelve was even back in Nauvoo. Most of the apostles, members of the Quorum of the Twelve were in the eastern states, and there were only one or two members in Nauvoo and two of them were wounded in and the attack on Carthage Jail. We’ll talk about several of the possibilities during the succession crisis. Check out our conversation, and don’t forget our previous episodes with Michael! 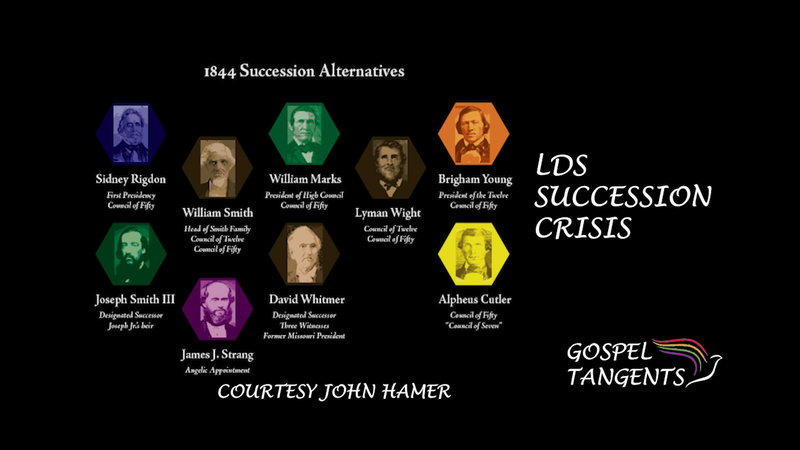 John Hamer lists several people with claims of succession. Dr. Michael Quinn weighs in.